News, tips, tutorials, reviews and everything else related to running linux on desktop, mobile and netbooks. Helping to improve experience of using linux operating systems since 2006! Adobe Air Environment is one of the hottest new technology around, it allows one to easily create cross platform Internet rich applications combing the strength of Adobe Flex , Adobe Flash , Ajax and HTML to create applications and widget that are Internet ready . Adobe Air allows one to deploy browser less rich Internet applications on desktop that are not bounded by local storage limitations or limited file system access as is the case with Ajax application running inside a browser. Now Adobe finally has released the stable version of the Air environment on Linux bringing it up to date with the version available on Mac OS X and Windows. Here in this tutorial , I describe how you can easily install Adobe AIR environment on your Ubuntu 8.10 desktop and some interesting applications that you can run atop Adobe AIR. To install Adobe Air environment open Terminal window from (Applications -> Accessories -> Terminal ) and issue the following command in the terminal window . 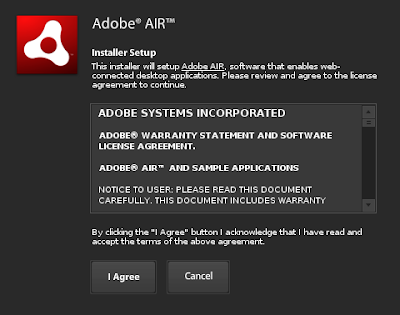 After issuing the above command you will get a installation dialog box like this follow the instructions to install Adobe Air . After installation is over you will find a menu item (Applications -> Other ->Adobe Air Application Installer ) which allows one to easily install Adobe Air applications. These are some of the Adobe AIR applications that I have found interesting , also I have tried including installation instruction and brief information about the application. ReadAIR is a desktop client of Google Reader ( News Feed Aggregator), it syncs with Google Reader and allows you to read the feeds you have subscribed to easily. ReadAir has an extremely simple UI and has same basic layout as Google Reader and is loosly themed like Mac OS X application. 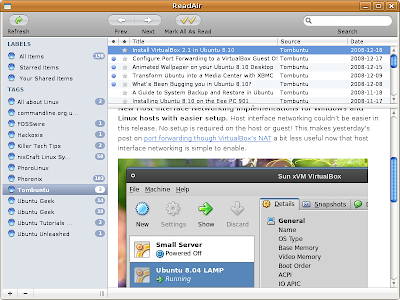 ReadAIR allows one to search through feeds , also it allows you to organize feeds using tags.Though , I was somewhat disappointed to find lack of Keyboard shortcuts. Now , you can install the downloaded the (.air) package using (Applications-> Other -> Adobe AIR Application Installer ) and once installation is over you can launch ReadAIR by clicking on the icon on the desktop. 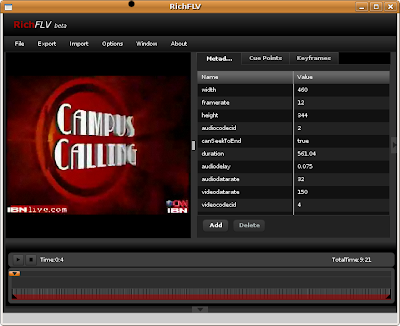 However , RichFLV is still in early stage of development and is an alpha release. RoadFinder combines Yahoo! Maps and Google Maps into a single application , and allows one to easily look up address using its intiuative interface. 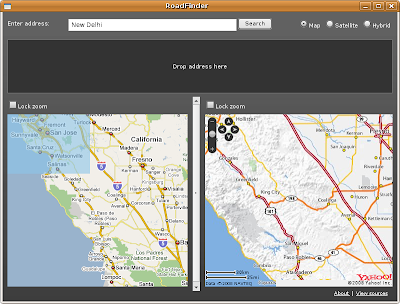 RoadFinder allows you to search maps for physical directions anywhere in the world, Also besides having option for maps it also allows you to view satelite images. Even after entering "New Delhi" RoadFinder kept showing US map. 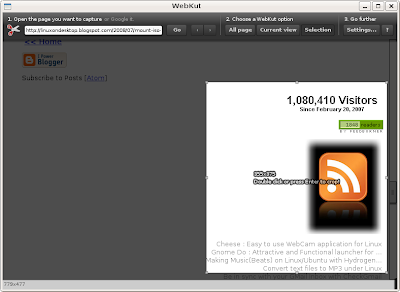 WebKut allows one to capture Web Pages or part of Web Page in an extremely simple way. You open the website you want to capture within the WebKut interface and capture WebPage using 3 capture options: the entire page, the current view, or only a selection. However ,the maximum dimension for an image that can be captured is 2880 pixels. WebKut in action, in the screenshot a part of WebPage has been selected to cut. Xdrive is a data storage service from AOL and gives you 5GB of free online storage.XDrive Desktop Lite is a desktop client for the online service and allows you to manage files in your online Xdrive account.Xdrive Desktop Lite supports drag n drop and allows you to drag files from your computer into your online Xdrive account. Directory listings of users you’re following, and your followers. Google Analytics is a statistics tool and provides you different stats about your site/blog. This application brings you the functionality of Google Analytics onto your desktop. The application has clean and simple Interface and allows viewing reports in tabbed manner. It allows exporting reports to numerous file formats like PDF , XML or Excel. Download and Install application from this link. 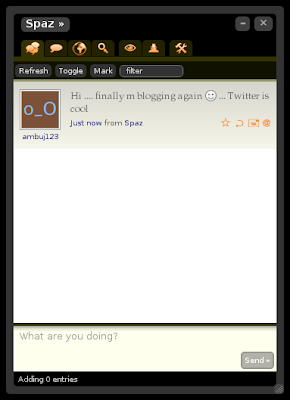 Fresh is a RSS Reader built using AJAX and Adobe AIR . 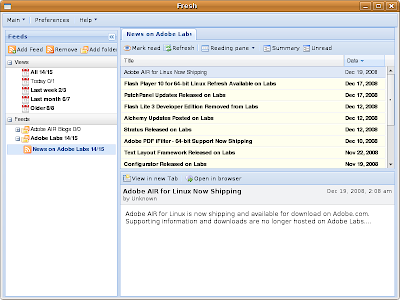 The Fresh reader features offline RSS reading, multiple panels within a single window, tabbed browsing, and basic browser integration. MiniTask is a easy to use task management tool and allows you to manage your todos list efficiently and properly. It supports drag 'n' drop reorder, alarm timers, printing of pretty task sheets, copying tasks from and to other applications etc. automatic management of internet connection (works behind proxies!). You forgot (for British readers) the just released BBC iPlayer app for linux. It can be found in the 'labs' section of the bbc iplayer website. Its certainly no coincidence that AIR 1.5 and this came out at the same time. I'm not really sure why it's doing that. Any ideas? I have installed the latest version of Air and Flash, but when I try to install the Google Analytics app, it doesnt work. From the site you linked to it tells me to upgrade flash player and the author's site nothing happens. Any suggestions for Ubuntu? I am an avid follower of your blog and would like your help in promoting my similar blog. http://ubuntuextreme.blogspot.com/ started when I realised I was posting a lot on ubuntuforums.org and writing numerous howto's. 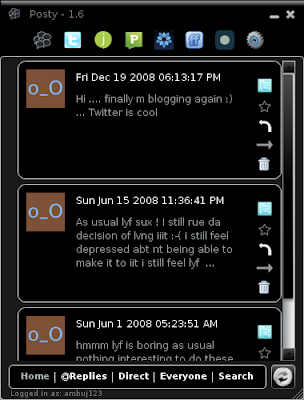 I realised that it would be useful for me to consolidate all of my posts into one useful blog. Please have a look, and help me get on my feet with it! If you would like help me to provide assistance with posts, I would be glad to help. While I am not the most blog-savvy, I have a fair knowledge of Ubuntu. I tried this on my friends pc and he was having the same problem , so what i did was download Analytics package from Windows and then run it on Ubuntu. its a little complicated then windows, but im still like this runtime! is adobe air included on the repo? "Error loading the runtime (libnss3.so: wrong ELF class: ELFCLASS64) "
It seems like this may be an issue based on your system. Were you able to get this running? libnss3.so: wrong ELF class: ELFCLASS64: you have installed AIR on 64 bit OS. It’s a great post Man, you really are a good writer! I’m so glad someone like you have the time, efforts and dedication writing, for this kind of article… Helpful, Useful, and Charitable.. Very nice post! In this article i describe some of the things to do immediately after installing ubuntu on your machine . Since most of the people reading this would be shifting from Windows to Linux with a system dual booting so i would focus more on making transition easy from Windows to Linux. Ubuntu 7.10 Codenamed Gusty Gibbon was released few weeks back with much fanfare ,now Ubuntu for past couple of years has been one of the most popular Desktop Linux distributions . Ubuntu 7.10 includes a number of features , applets and Wizards to simplify desktop Linux experience however because of many licensing restrictions it does not include out of the box support for popular audio/video codecs and many commercial but good applications . Also because of the limitation of trying to accommodate all kind of applications on single CD Ubuntu comes with a limited set of applications . Ubuntu Linux is one of the most popular Linux distribution , it is especially popular among Linux newbies and windows refuges . Now Ubuntu Linux does come with a descent set of applications , still there is a scope for including some more quality applications and especially games . Now in this tutorial i will show you how to install a large number of small , easy and less resource hungry games on Ubuntu Linux with screen-shots of games . Rocks 'n' Diamonds is a Boulderd*sh game for X11 with more than just the falling rocks and diamonds of its namesake. The object is still to collect all the diamonds (and emeralds), then get to the exit before time runs out. But your character must make use of bombs, spaceships, and many other elements in order to fill his quota of jewels. Now many applications need additional repositories to be installed or some to be enabled in Synaptic package manager so before trying out steps given below ensure that repositories in order.